Hydrochloric acid is a colorless or slightly yellow, pungent liquid with a pH less than seven. Its molecular formula is HCl. While most known for its industrial uses, HCl is also the primary constituent of gastric acid. Believe it or not, your digestion system depends on HCl to process the food you eat. 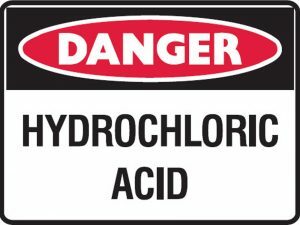 Hydrochloric acid was first discovered around 800 A.D. Since then, uses for this versatile acid have grown substantially. Hydrochloric acid has a wide range of industrial applications. Manufacturers use HCl as a raw material to produce products like polyvinyl chloride (PVC). It helps control the pH level of certain manufacturing processes, including drinking water and pharmaceutical production. It is also used for processing of additives in the food industry. Hydrochloric acid is one of the strongest commercial cleaning agents available. It removes rust and scale from steel in a process called pickling. Swimming pool operators use HCl to neutralize pH levels in pools. It is even used as a conductor in cellular phone and computer parts, and in the regeneration of ion exchange resins. A mixture of HCl and nitric acid is one of the few known materials that dissolves gold. This unique property allows its use in the etching of gold and other precious metals. With such a wide variety of users, hydrochloric acid appears in many different applications. However, it is a hazardous chemical and users must handle and store it safely to prevent injuries. HCl is highly corrosive. Its fumes are toxic to humans and can even result in death. In low concentrations, hydrochloric acid irritates the skin and eyes. Higher concentrations are dangerous as the acid becomes more corrosive. HCl attacks any mucous membranes it comes into contact with. Exposure causes severe respiratory tract and lung damage. Store hydrochloric acid in well-ventilated environments due to the toxicity of the vapors. Secure storage buildings to prevent unauthorized access by personnel unfamiliar with the risks. Never store HCl in metal containers. It will attack the storage vessel resulting in a spill. PVC containers are recommended for hydrochloride acid storage. U.S. Chemical Storage supplies non fire-rated CHEMLoc storage buildings as a solution for storing corrosive liquids like hydrochloric acid. Mechanical ventilation or gravity air flow vents provide constant air circulation and protection from the buildup of harmful fumes. U.S. Chemical Storage buildings offer spill containment and corrosive resistant components for compliant and effective storage of HCl and similar corrosive liquids. Proper hydrochloric acid storage is critical for employee safety and to prevent fines. U.S. Chemical Storage CHEMLoc storage buildings are compliant with all regulatory standards. Find out more about our chemical storage options here. Sciencing. Can I clean gold with Hydrochloric Acid?